(Honolulu) – Just before 10:30 this morning DLNR Division of Conservation and Resources (DOCARE) officers monitoring fishing activities on the first day of the Akule (Big Eye Scad) season, off Haleiwa on O‘ahu’s north shore, began watching the vessel Isao. It is a commercial shark diving boat based at Haleiwa Small Boat Harbor. Officers witnessed a crew member holding a bucket and chum the water by throwing fish into the ocean. Several sharks appeared, attracted by the chumming. DOCARE officers determined the boat was in State ocean waters. 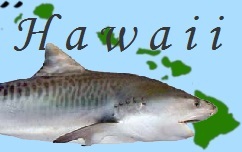 Hawai‘i Revised Statutes prohibit activities relating to the feeding of sharks in state waters. The law provides very narrow exceptions such as for cultural or religious practices, provided the feeding is not part of a commercial activity. “The safety of everyone who uses our ocean resources continues to be a high priority for DOCARE. State law recognizes that sharks are dangerous and prohibits feeding them in state waters to discourage activities that may increase the risk of conflicts with people” said Acting DOCARE Chief Jason Redulla. Officers cited 35-year-old Marven Ribeiro of Pūpūkea for feeding sharks. The violation is petty misdemeanor that upon conviction could have fines and jail time. Ribeiro will be required to appear in Wahiawa District Court. CORRECTION: Man cited for chumming sharks today is Marden Ribeiro. He was on a North Shore Shark Adventures vessel.